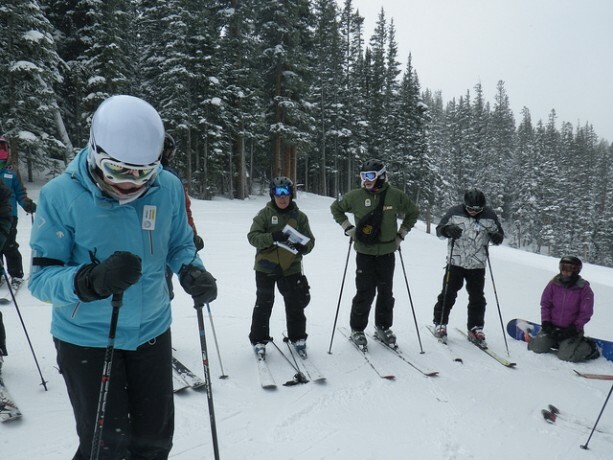 Winter recreation meets outdoor education when you go skiing with a Ranger at Breck. After meeting at the base of Peak 7, skiers and riders descend a groomed intermediate run with a volunteer ranger from the Dillon Ranger District. On select Fridays throughout the season, guests with a valid lift ticket (day or season pass) ride the Independence SuperChair and make stops at six teaching areas along the way. Each of the stops offers an opportunity for guests to learn about the local ecology, including the different kinds of trees, wildlife, and terrain. There are six stops along the way that the ranger uses as an outdoor classroom to tell stories. 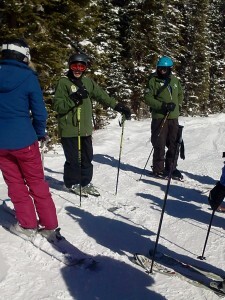 Here are 6 things you could learn about when you go skiing with a ranger at Breck. According to the Summit Daily News, “Ranger Dan Schroder encourages folks to engage their five senses and get to know the forest in a way that most probably haven’t. Lick a tree.” When I was a teacher for the Keystone Science School, I used to have kids touch the Aspen trees and taste a few pine needles along the way. Take a mountain tour on skis with a naturalist guide who is knowledgeable about the local history, including how this area had been inhabited by the Utes for thousands of years before being first discovered by trappers, and then the gold miners. Tales from a more recent time period describe the simple start of the Breckenridge Ski Resort, one chairlift and the t-bar. Situated underneath the gondola area, these wetlands are protected through a partnership between the Town of Breckenridge, the United States Forest Service, the Dillon Ranger District and the Breckenridge Ski Resort. This area provides habitat for a rare type of toad, Moose, fox, birds and other animals and plants. There are lots of dead and dying trees in our forest, thanks to the Pine Beetle. You will learn about the effect they’re having in the White River National Forest, and which kind of trees the beetles are attracted to, and what efforts are being made to address the situation. You will also learn how to tell the difference between a pine tree and an aspen tree. Maintaining the advanced terrain at the Breckenridge ski resort includes daily efforts from a team of professionals versed in the science of snow. The booms you hear every morning in Breck are the explosives being thrown by ski patrol to purposely cause avalanches. Environmental efforts by the Breckenridge Ski Resort include renewable energy use, recycling, wildlife habitat preservation, and composting. In fact, over 52 tons of food scraps are composted each year. Locals can even get a discount for carpooling — four or more riders and parking is only five bucks.